Blame being thrown around in Washington for GM’s plant closures, GM’s president joins self-driving car unit, more discussions about U.S. manufacturing plants and so much more for The Morning Shift of Friday, Nov. 30, 2018. Ever since GM announced on Monday that its restructuring would involve shutting down five manufacturing plants in North America, and possibly a 15 percent workforce reduction, lots of folks have been pissed. Not just locals in those assembly plant communities, but also politicians in D.C., as we reported earlier this week. “We need to, as a Congress, be addressing public policy issues that keep manufacturing in this country,” said U.S. Rep. Debbie Dingell, D-Dearborn, a former GM employee who struck a rare note of public anger at her old company. ﻿Dingell said she is “bound and determined” to make sure Congress does not approve the Trump administration’s proposed replacement for the North American Free Trade Agreement unless it ensures “that we’re not moving jobs to Mexico. Politicians are pissed. More importantly, workers and their families are pissed. Everyone’s pissed. Nice going, GM. General Motors and its self-driving unit, Cruise, have appointed GM president Dan Ammann as the unit’s new CEO. He will work with Cruise’s co-founder Kyle Vogt, who will be chief technical officer and president with the aim of “[transform] mobility through the safe deployment of self-driving technology,” GM says in its press release. For Cruise, the move is about building a bigger management team to transcend from a technology skunkworks focused on creating autonomous cars to a more developed business that brings in revenue. The reshuffling will allow Vogt and [Chief Operating Officer] Kan to focus on technology while Ammann runs the business and looks for new partners and sources of capital — and possibly even preparing to spin out the company one day. GM is clearly trying to be as lean as possible, while also staying—or at least appearing to stay—on the cutting edge of technology. 3rd Gear: Could More GM Plants Be on the Chopping Block? There are reasons to keep them open. Sports cars including the Corvette and Camaro typically see wild sales swings, with demand surging for revamped versions, then tapering off once they’ve been on the market a while. It must be stressful to work in a GM car plant right now, especially one that’s not running anywhere near capacity. Earlier this week, we reported on a Bloomberg story saying that BMW was considering building a new engine and transmission plant in the U.S., as the company tries bolstering its supply chain for its Spartanburg, South Carolina factory in the wake of U.S. import tariff and Brexit-related uncertainty. President Donald Trump congratulated BMW AG for building a “major new plant” in the U.S., taking a swipe at General Motor’s move to close several factories. The only problem is that the German carmaker’s decision hasn’t been finalized. Of course, this doesn’t necessarily mean the president misread the reporting—it could just be his way of trying to put pressure on BMW to follow through. According to Bloomberg, this plant could help the company meet local content requirements, which dictate that a certain percentage of a vehicle’s parts should come from domestic sources. Volkswagen just announced that it is working with British retailer Tesco to install over 2,400 EV charging stations in 600 store parking lots around the nation. On this day in 1965, 32-year-old lawyer Ralph Nader publishes the muckraking book Unsafe at Any Speed: The Designed-In Dangers of the American Automobile. The book became a best-seller right away. It also prompted the passage of the National Traffic and Motor Vehicle Safety Act of 1966, seat-belt laws in 49 states (all but New Hampshire) and a number of other road-safety initiatives. 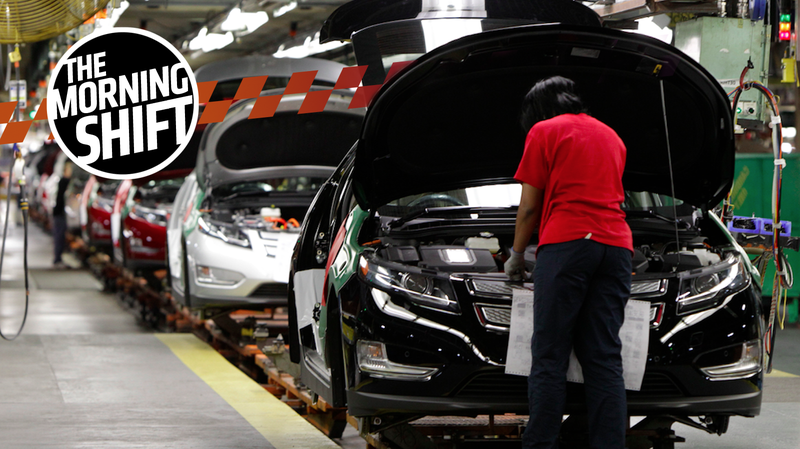 Neutral: How Do You See the Future of U.S. Auto Manufacturing? Tariffs. Plant Closures. New Plants. When it all shakes out, where will we be?